After 20 years of unprecedented lows, Canada's central bank is gradually raising rates; this, combined with strict rules on new loans, empty house taxes in overheated cities like Vancouver, and mandatory ownership disclosures (which keep money launderers out of the market) are depressing the Canadian housing market, and the prognosis is not good. Canada's economy is heavily dependent on construction (8% of the job market) and consumer spending, and both of these will fall as cheap capital evaporates and debt payments shoot up, potentially triggering a contraction spiral. Taken separately, each of the measures that are cooling the housing market are sensible and long, long overdue -- and it's the tardiness that is the problem. Time and again, Canadian politicians and regulators have kicked the can down the road on the unsustainable housing bubble, leading to a situation in which every possible outcome is impossibly terrible. The original sin was allowing Canada's cities to become speculative vehicles for global criminals looking to stash their capital outside of the states they'd helped loot into near-collapse. Then, to allow Canadians to bid against the looters, the banks loosened up lending rules, larding Canadians with unsustainable debt -- and driving up housing prices, attracting more offshore speculators, requiring even more cheap debt for the Canadians who actually lived in the cities (lather, rinse, repeat). The result is debt of every kind: policy debt, cash debt, city planning debt, and it's all coming due at once. Think of the interest rate hikes: the law of small numbers means that even modest rate hikes have huge effects on borrowers. 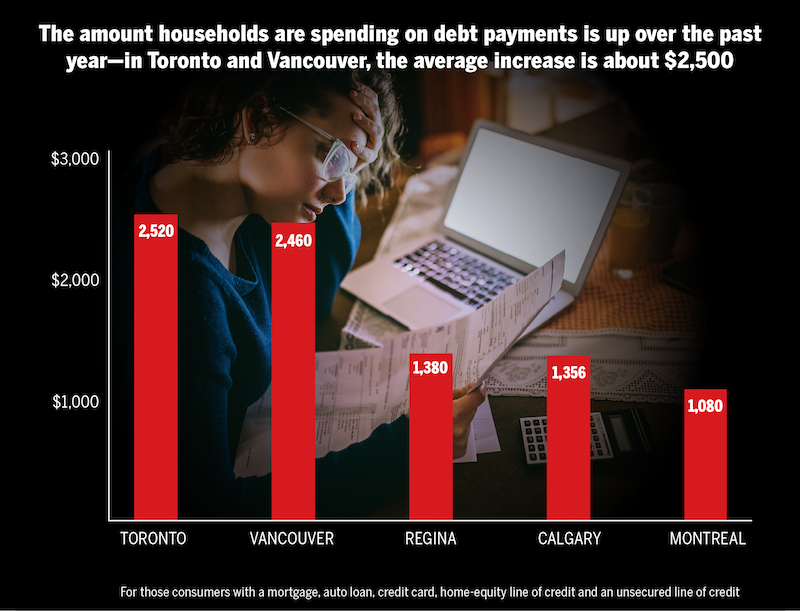 Canada's base-rate may be a low 1.75%, but that means borrowers are paying 15% more than they were a year ago to service their debts. It doesn't help that the new rules are often badly constructed (people who want to roll over their mortgages with their existing lenders are not subject to stricter lending rules, but they have to pass those rules to switch to another lender that might offer better rates), and that they don't reflect regional differences (Calgary, where house prices plunged after the oil shock, does not need the same restrictions as Vancouver and Toronto). Canada's national debt-to-income ratio is 173.8% (it's 208% in Toronto and 242% in Vancouver). That's significantly higher than the US ratio on the eve of the 2008 crisis. Canada was once praised for its foresight and mature handling of the crisis, but it's increasingly apparent that much of that alleged wise planning was just deferment -- with interest. There are solutions! Canada issues its own sovereign currency and most of its debt is denominated in CAD. That means that it can deploy modern monetary theory, adding money to to economy without risking inflation, through a jobs guarantee, and put all the idle workers and capital resources to work. Many economists have been surprised by how quickly the impact from rate hikes has rippled through the economy. In a recent report, CIBC economist Royce Mendes notes it historically takes six quarters for the full effect of a rate hike to show up in slower spending. Yet it hadn’t been that long since Poloz’s first hike in July 2017 before the first pinch was felt. “The fact that the effects are showing up sooner this time around could simply be a sign that the storm will pass quicker,” Mendes writes. “But more likely it’s a reflection that models based on historical evidence will tend to underestimate the effects of rate hikes on the Canadian household sector in its current indebted state.” In other words, we’re in uncharted territory. Consider, for example, the auto market. Canadians have always loved their cars and trucks, and thanks to the availability of cheap loans with 84-month terms, our tastes have grown more luxurious in the past few years. Elite brands like BMW, Mercedes and Lexus currently account for about 12 per cent of all vehicle sales. But dealerships are now seeing fewer customers walk through their doors. The number of vehicles sold in Canada outright shrank in October, compared to the year before. It marked the eighth straight month of declines, the longest stretch of negative sales since the Great Recession.